Le Grand Vostock is a recent Russian winery which started in 2003 on the grounds of a former soviet kolkhoz centered on grape growing. After a careful soil selection and replantings, it started production and has now a size large enough to keep prices down and small enough to target the quality-tier sector of wines. The winery is managed by two French expatriates, Franck Duseigneur and his wife Gaelle, who live in the village year along with their young son who was born in Moscow. When we visited the winery in mid-september, the Chardonnay and the Sauvignon were already harvested, the harvest had begun september 7th on the property. This very day, they were in the midst of the harvest of a big 28-hectare block with Aligoté. The yields are quite uneven there, says Franck's wife Gaelle : there's been a severe frost last winter and quite a few vines died. We would shortly later go see the pickers, who are middle-aged villagers from the area. Gaelle & Franck DuseigneurThis was surprising to see two French expats, husband and wife, living in this remote corner of Russia, so I asked how they landed here. Franck says that they both graduated from the ENITA engineer school in Bordeaux, which trains on viticulture and forestry. He was on the viticulture side and his future wife, whom he met there, was on the forestry side. He later spêcialized in winemaking and worked subsequently in a coop winery while Gaelle worked in Bazas at the end of the Sauternes area doing forestry management. They were looking for a job where they could be together and Franck answered to an offer offer that he thought was for a location in the Bordeaux area. He had an appointment for the job in Paris and was surprised to learn that the job was based in Russia. Another surprise was that they were chosen for the job. They were 27 then and after thinking about it, they were seduced by the passionating prospect of having to lead a winery from its very beginnings. And that's how they started a new life in the Kuban region. Gaelle had her first child _a boy_ here in Russia. She spent some time in Moscow before and after the delivery, which was in december, and although the conditions were very comfortable, the Russian winter and isolation from her family was difficult. For her next baby, due for next december, she'll go back to Bordeaux a couple of months. Franck Duseigneur in the vineyard Le Grand Vostock was founded by Moscow investors among whom today the major shareholder is Serguey Zeltov. They kept some of the vineyards from the original surface of the pre-existing kolkhoz (soviet-era farm) which was formerly growing grapes for wine kombinats, and they uprooted the rest, in particular the hybrids and other uninteresting vineyards, which were often planted in the flatlands. They began to replant immediately, but not on the soviet viticulture mode which is 4 meters by 2 meters (read : 4 meters between rows and 2 meters between vineroots), which makes 1000 vines/hectare, that is not much, and was usually compensated by huge yields. In Russia, the vines usually carry lots of grapes and get tired very fast. That's why the practice around there to uproot and replant every 12 years or so. By the way, back in 1997-1998, the former director of the kolkhoz had made a trip in France and when he came back he began to plant in 3 X 1 (3 meters between rows - 1 meter between vines), which made 3000 vines/hectare and was already better. They kept these replantings in the Grand Vostock vineyard, by the way. Now, Frank and Gaelle planted at the ratio of 1,8 X 1 (1,8 meter between rows - 1 meter between vines) which makes a density of 5500 vines/hectare. This vineyard density is an important part of the final quality of the wine. Franck Duseigneur checking the AligotéThere has been of course big investments in the vineyard, for the replantings and also for the tools like narrow tractors specially designed for the vineyard. On the 1st year in 2003, they planted 30 hectares at once, Merlot, Cabernet Franc, Cabernet Sauvignon and Syrah, all the grafting being imported from a nursery in France. There weren't too much problems to import the baby vines, there is no quarantine in Russia for varieties which got the authorization, but it was still a long process. When they arrived there, the planted surface made a total of 550 hectares, and they didn't use all this vineyard. In 2006, they had severe frost in winter with something like minus 28 ° C during a whole week and half of the vines died. They planned initially to replant progressively to ameliorate the vineyard base, but this unexpected frost forced them to accelerate the pace of the replantings. Now, they have about 250 hectares in production (312 hectares planted). In 2006 they planted some red, Cabernet Sauvignon, Cabernet Franc and Merlot. In 2007, some white, Chardonnay, Sauvignon and Pinot Blanc for about 20 hectares. In 2008, they planted some 12 hectares of Aligoté and also some more Chardonnay & Sauvignon for another 15 hectares. The best approval for this Aligoté... They plan to stabilize the vineyard surface of le Grand Vostock at 300 hectares : that's about the maximum capacity of the winery structure, which can handle a yearly output of 10 000 hectoliters of wine. The total surface of the former kolkhoz that they took over makes 800 hectares on which there are arable land, forests and lakes. That leaves room to properly choose where to plant vineyards. They made pedologic studies of the soil across the property in 2003 and sent the soil samples in France to select the best terroirs. Gaelle says that the terroirs are very good here, there is in some parts some limestone, also clay with a thin layer of earth and rocks below, definitely not a wheat soil, but good for vines. The soil analysis opened the way to the selection of the right rootstock (something which is often disregarded), and of the variety to graft on it. For the reds, the majority variety is Cabernet Sauvignon. They have 4 hectares of Pinot Noir and some Krasnostop which are both used for the upper-tier and middle-range wines. Krasnostop, which is quite common in the region, is a Ukrainian cousin-variety of Cabernet Sauvignon, and quite a good variety, actually. Until last year they had a bit of Saperavi, another regional variety, but there isn't much left today. Hand-harvest of Aligoté Le Grand Vostock is a small structure for Russia, where as said before big-size industrial wineries are the norm. This is also a rare structure to share European features : a man (or a woman) being in the winery all the time to manage the winery, check the vineyard management and at the same time tasting the juice during the harvest and vinification and otherwise being always physically present in the facility like any other worker. Mega-wineries in contrast, operate like in the big industry : the manager is in his office and the different functions are accomplished by different people without the necessary coordination, which is a problem if you want to get the best result in the wine. In this regard, and in spite of its 300 hectares which seems big from a European point of view, le Grand Vostock has a serious approach in terms of quality. By the way, Franck and Gaelle didn't speak Russian when they landed here and they both learnt Russian on the workplace, without setting a foot in a school, which shows a great flexibility and learning skills. The in-house lab In the middle of the facility stands a white immaculate room where several people work on the juice analysis (among them on this picture, Gaelle and Franck : that's the in-house lab of le Grand Vostock, where Franck and Gaelle can monitor the juice and see what's going on, taking the best-suited decision on the conduct of the vinification. Other emerging/aspiring wineries often ask Franck and Gaelle for help when they need lab tests, because there isn't yet anny independant laboratories to help small wineries. And for a good reason : there isn't any small wineries in Russia in the first place... The press Le Grand Vostock also helps those who haven't yet the right to operate their own bottling line : sometimes, wineries are allowed to operate for the winemaking side, but not to bottle their wines. Gai Kodzor for example bottled its first vintage here. It could have lasted a few years but happily for them, they got the authorization to bottle their wines themselves the following year. This pending-winery waiting for years for the green light of the administration is headed by someone named Marina Bernier and it is locatedin the village of Natukhaevskaya (натухаевская), east of Anapa and on the other sid eof the hills range from the village of Sadovy. I'd have liked to visit them but I guess that because of the situation, they didn't want to stir up the things and I fully understand them. 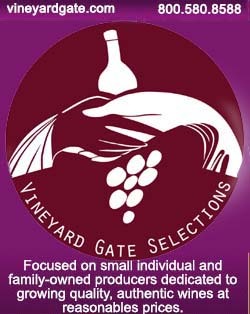 I think it's quite admirable for a now large and establish winery to help younger and smaller wineries whenever it cans. It reminds me some friendly relations between vignerons that I came accross now and then in the country that I know best, France. A vatroom at le Grand Vostock In 5 years, when the 312 hectares will be fully in production, they should make 1,2 million bottles, which is the maximum capacity of the vatroom. Today, it's about 650 000 to 700 000 bottles, of which 40 % are sold to the supermarkets (like Auchan-Russia), 40% to minimarkets like for example the Magnit chain, and individual shops (see on the right a delivery truck loading cases at the winery), and 20% through direct sales, either here at the village shop (a restaurant with wine shop operated by the winery) or through delivery. The wines cost between 150 Roubles and 800 Roubles a bottle (between 3,5 € and 20 € - 100 Rbs = 2,5 €). The average price of a bottle leaving the winery is 5 €. Much of the tools and equipment here is imported, like for example the 100-hectoliter pneumatic Bücher press, and as usual in any winery in the world, the pumps are Italian and the filters are German (and the Press, French). By the way, on the right of the press, you can see the weird volume-checking container which is part of the tols imposed by the administration in Russia (and not really useful if I understood correctly). Le Grand Vostock also built a separate office with its own telephone line to transmit the data of visiting administration controllers, as the law makes it compulsory. Franck says without more details that the winery spends roughly 500 000 Roubles a month to pay for sale rights and maintain a system with lots of red tape and diverse compulsory tasks. I see that the French bureaucracy isn't entirely alone in its penalizing handling of the wineries. The facility - the harvest reception on the right While touring the facility, we pass several rows of stainless-steel vats. The whites ferment in a separate room. Franck says that he doesn't promote the enologic products. Samely, he often avoids to fine the wines at the end of the vinification. He picks the grapes relatively ripe, for example the first Aligoté grapes to be picked (the whole harvest of Aligoté takes a few days) were at 11,8 ° or 12 °. The ones coming in this afternoon were at 12,7 ° because this is a part of the block which is traditionally riper than the rest. For the reds, he makes macerations for 1 week or 10 days, sometimes 20 days, it depends of the cuvée. He works often with délestage, which is if I understand well taking away part of the juice or the lees. He makes a good extraction at the beginning, before the wine reaches 13 °. Another thing is the reds always make their malolactic fermentation, the whites rarely. SO2 is added when the grapes come in, then during the press stage. Most of the SO2 gets away with the lees. The norm in Russia is 200mg/liter and his wines never reach these levels. He puts 5 grams for 100 kg of grapes in total. He adds that he can limit the use of SO2 through frequent tastings and checks of the juice. Franck Duseigneur tasting his winesWe follow Franck to a corner of the facility with quite a number of casks with wines going through their élevage. He has brought a few bottles so we can taste. Vadim, who is at the wheel, doesn't drink or taste a drop, and beyond saying him thank you again for this sacrifice, I can't but say that I admire how seriously drivers in Russia respect the no-drop-of-alcohol-when-driving. __ Grand Vostock Chëne Royal Blanc 2007. Chardonnay. Costs 800 Rbs, or about 20 €. Quite woody in the mouth, with a vanilla feel. In 2007, there was 15 % of new oak. Richness. The wine has been stirred once a day, then every now and then. Speaking of the local cooperages, they began to work with one of them in the early years but the quality dropped quickly after, they probably couldn't keep with the demand and didn't have time to let the wood dry properly. They usually resort then with drying articially the wood which has not the same result in the quality of the wood and its tannins. So they now import French casks. In the cask room__ Grand Vostock Selection 2008, red (there's a white selection too). Cabernet Sauvignon and Saperavi. Costs 210 Roubles usually (5 €). Pleasant nose, cooked fruits. The mouth is samely pleasant with what seems to me thin tannins. Nice to drink albeit with lightly sugary feel. There's the nice ink/liquorice feel in the mouth brought up by the Saperavi. He says that he would like that this type of wine could be a standard for Russian wines in this price bracket. 100 000 bottles made of this wine. He says that this wine is more complex thant his Terres du Sud cuvée. I bought a bottle of this wine later and didn't like it, seemed different, the soft tannins somehow were not there. Speaking of the vineyard management, Franck says that there are few pests and they use very little insecticides. When they use some, it's on several selected plots. He uses chemicals in the vineyard so as to go less thee. He doesn't use herbicides in the young vineyards, but he says he has to for the older vineyards because there's too much width between the rows there to do the ground job with a tractor. He has 5 tractors altogether but he would need 20 tractors if he worked organic with this surface. I happened to have a bottle of Terres du Sud, a cheaper cuvée of Grand Vostock (170 Rbs), which was interesting, obviously much better than any other Russian wine at this price. __ Grand Vostock Cuvée Karsov 2008. Red. Nose more complex indeed, and appealing, some dirt. 50 % Merlot, 30% Cabernet Sauvignon, 20 % Krasnostop. The latter brings the dark color, some tannins and red fruits aromas. Tannins still present. Chateau Le Grand Vostock Sadovy, Kuban region (Russia) phone + 7 495 785-88-65 Wine prices including delivery (inside the MKAD, the ring road circling Moscow) wine-tourism stays near the winery info [at] grandvostock [dot] ru www.grandvostock.ru From Russia, with love...There's no way around : Russian girls are among the most beautiful in the world and from the youngest age they already look like princesses. I shot This picture during a private event near Krasnodar, the capital of Kuban, the Russian wine region along the black sea.